This Peanut Butter Cup Hot Chocolate is rich, creamy, and comforting. It’s easy to make and tastes just like a peanut butter cup, drinkable form. 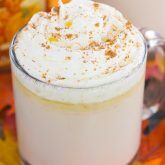 This is the perfect drink to keep you warm all winter long! I’ve mentioned this before, and I’ll say it again, it’s the little things in life that make me happy. My morning cup of coffee, watching the Food Network on lazy Saturday mornings, climbing into bed with freshly washed bed sheets and blankets, and relaxing with a pizza on Friday nights are just a few things that make me happy. Hot chocolate also makes me happy. During the summer, or in the dead of winter, I drink hot chocolate throughout the year. If you remember, I’m almost always cold. So I’m usually bundled up in a sweatshirt when it’s 90 degrees outside, or cozied up under my electric throw blanket when the temps dip below freezing. So, needless to say, lots of hot chocolate is consumed in my house. That, coffee, and chai lattes, with the occasional cup of tea thrown in there. I love to hold a hot mug of something while I’m working on blog tasks, reading a book, or watching TV. If you love peanut butter cups (Reese’s I’m looking at you), then you’ll adore this Peanut Butter Cup Hot Chocolate. It basically tastes like a peanut butter cup, in liquid form. Man, oh man, is it good! And if combining chocolate and peanut butter wasn’t enough, I topped this hot chocolate with thick whipped cream, a peanut butter drizzle, and mini peanut butter cups. Oh, peanut butter, how I love you. 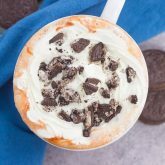 Smooth, creamy, and with the perfect amount of flavor, this Peanut Butter Cup Hot Chocolate is the most delicious drink to warm you up and satisfy your peanut butter cravings. So grab that mug, whip up this easy hot chocolate, and savor the deliciously decadent, peanut butter taste that will warm you up all season long! Looking for more drinks? I’ve got you covered! 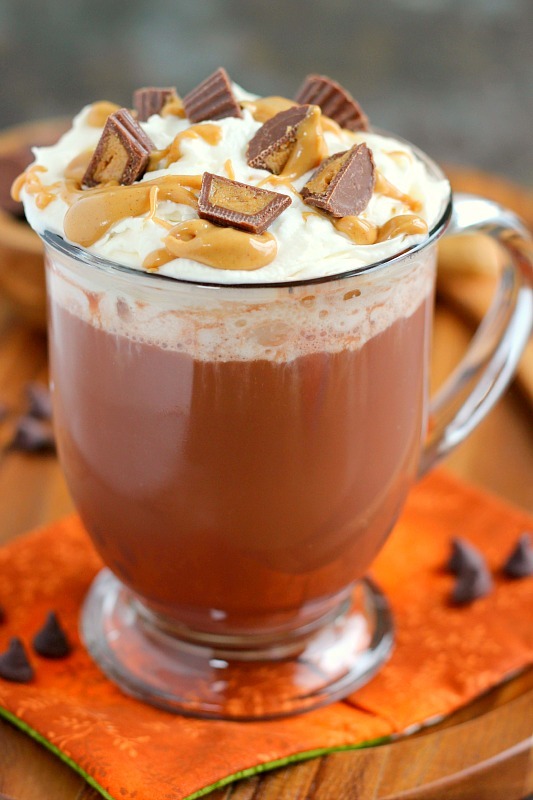 This Peanut Butter Cup Hot Chocolate is rich, creamy, and comforting. It's easy to make and tastes just like a peanut butter cup, drinkable form. This is the perfect drink to keep you warm all winter long! 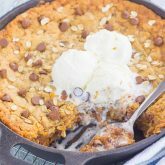 In a medium saucepan, combine the milk and chocolate chips. Warm over medium heat, stirring occasionally, until chocolate is melted and smooth. Remove mixture from heat just before it begins to boil. Stir in peanut butter. Set aside. In a small bowl, heat remaining 2 tablespoons of peanut butter in microwave for about 10-12 seconds, to create a drizzle. Set aside. Pour hot chocolate into a glass. Top with whipped cream, drizzle with warmed peanut butter, and sprinkle peanut butter cups. You're singing my song today, Gayle! You know how much I adore anything with PB cups. And my idea of a perfect moment would be drinking this under a blanket while I binge watch episodes of the Great British Baking Show! I'm giving this a shot! Um, this hot chocolate is completely INSANE, Gayle! Wow, you have seriously given me the hugest hot chocolate craving ever! 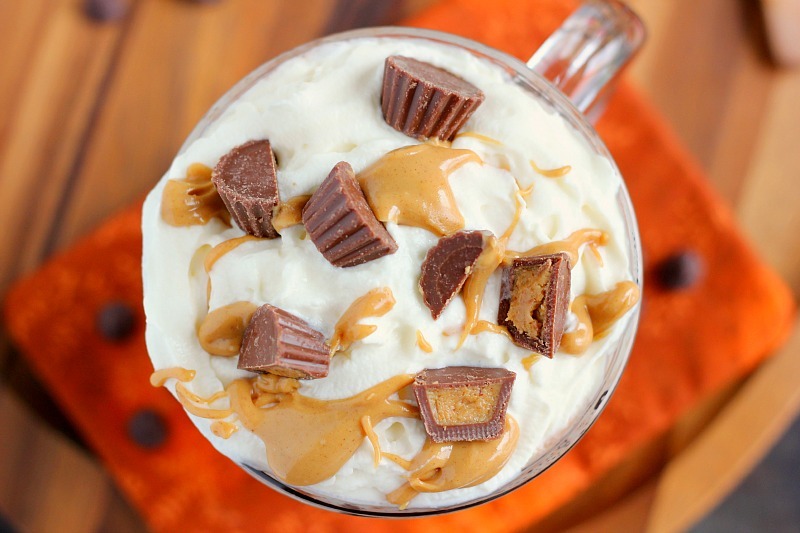 What could be better than pb cups and hot chocolate all in one cup?? Thanks, Sarah! Chocolate and peanut butter are the best together! This is my kind of hot chocolate! Yum! This hot chocolate will definitely make me very happy! Love it! Perfect because I'm always cold, too! Thanks, Mira! I'm always cold too, so I love sipping on this drink! Peanut Butter receives lots of love, doesn't it? But is absolutely deserves it! Oh myyyy, this hot cocoa is speaking my language, Gayle! Have a great weekend! This looks like the best kind of hot chocolate seriously! I need to whip up a batch soon! Have a great weekend Gayle! Thanks, Manali! Hope you have a wonderful weekend, too! Haha I do the exact same thing! Thanks for the hot chocolate love, Amanda! Girl this looks so so good!! I am all about warm cozy drinks and this is right up my alley!! 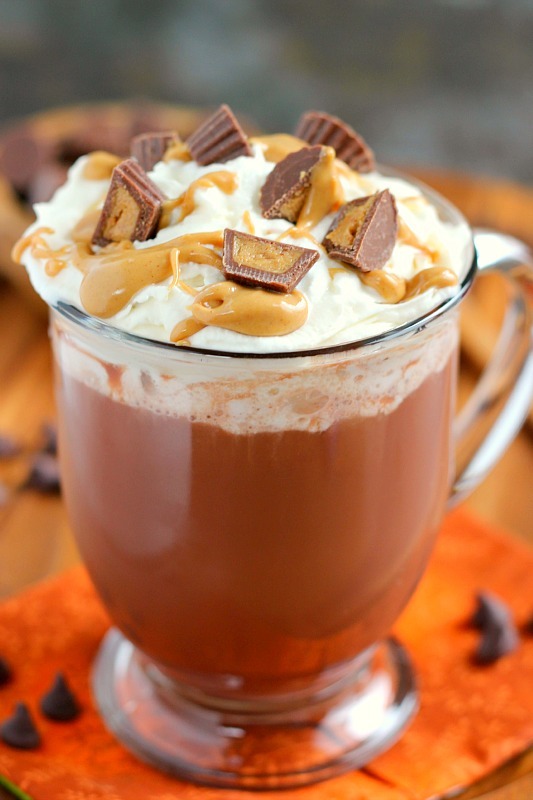 You know the way to my heart, chocolate and peanut butter and I need this hot cocoa in my life ASAP! Yes! Chocolate and peanut butter are the best! Thanks, Aimee! You sound SO much like me! I love to have something warm in my hands...especially at this time of year...because I'm always cold! I've never thought to add PB to hot chocolate, but it's such an obviously delicious choice. I'm going to remember this for next time!!! TGIF, right? Let's go get our Friday night pizza! 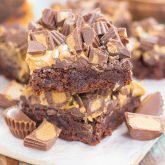 Oh, stop Gayle -- this looks insanely good with those mini peanut butter cups on top! I've never even thought to add peanut butter to my hot chocolate, and I definitely need to try it! Thanks for the hot chocolate love, Marcie! OMG! Oh no you didn't ! UhhhUHHH I would drink this at EVERY single meal. EVERY SINGLE ONE. This is the ultimate hot chocolate, Gayle! I am always cold too so warming up with a big cozy mug of this is a must! Love the peanut butter cups! Thanks for the hot chocolate love, Kelly! Swooooon. Washington feels extra cold after a few days in Hawaii and I need a big mug of this ASAP to keep me warm and full of chocolate :) love this! OH MY GOSH - I literally wanted to reach through my computer screen and grab that gorgeous cup of hot chocolate. It's just plain perfect!!!! Thanks for the hot chocolate love, Kate! This is just the best looking hot chocolate I've ever seen! Why have I never had peanut butter in my hot chocolate before? That's just plain brilliant! Whoa, this is my kind of hot chocolate! I wish I had a mug of this in front of me right now!